I love The Cult. My little brother, who is ten years younger than me, probably won’t remember the time I subjected him to an endless loop of Sonic Temple as he shared my headphones when we were visiting the grandparents over twenty years ago now. But those guys still rock! The Cult has a song called “In the Clouds.” Ian Astbury belts out, “What makes you think it’s okay?” One of the hardest things as a writer is to identify our own weaknesses. As I go through novel revision there is a thing I like to do which helps me identify what I was most concerned with when I wrote the first draft. This can point out the story strengths and weaknesses at the same time. It is called Wordle. 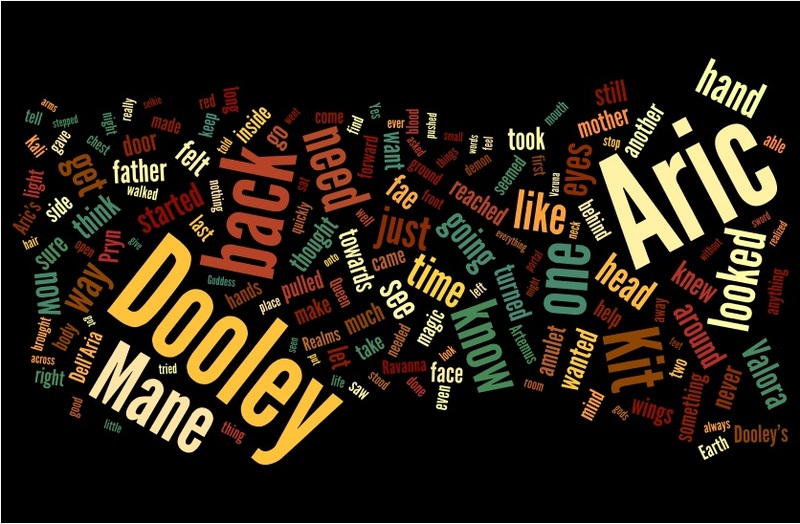 There really is no better tool for visual learners then to feed your story through this word art generator that takes your manuscript and populates it into a word cloud. It points me to the themes in my novel and it shows me the common words I have overused. Here is the Wordle of the first draft of Fae Guardian. I think I will have to do a search and replace of the word “back” because I am pretty certain that word isn’t that important. I already knew that one of my overused words was “started” and there it is again. But at the same time I have an equal use of the words Dooley and Aric. This was what I wanted. And because I cannot get enough of Ian Astbury, here is a live performance of In the Clouds. Keep your head in them and enjoy. This entry was posted in Procrastination Station and tagged novel revision, On Writing, websites for writers, writing tips, writing tools. Bookmark the permalink. I am happy to have found wordle through you, great tool for finding your overused words.